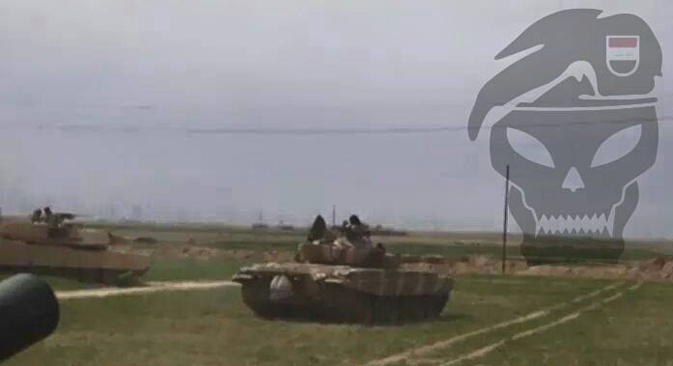 Despite having earlier professed a preference for the American M1A1M Abrams tank, the Iraqi army is now showing renewed interest in the capabilities of the Soviet T-72C vehicle as it ramps up the campaign to liberate its cities from Islamic State militants. According to sources in the Czech media, Iraq is soon to take delivery of a shipment of T-72Cs from the Czech army, adding to arms sent by Russia in 2014 as supplies of U.S. weaponry appear to be dwindling. Last week a sensational photo appeared on the internet of the American M1A1M Abrams tank (from the Iraqi armed forces) and the Russian T-72C tank (from the Iranian Shiite army) waging a concerted attack to liberate the Iraqi town of Tikrit, which is being held by the illegitimate armed formation known as the Islamic State (ISIS). Veterans of the Cold War which had threatened each other from opposite sides of the Iron Curtain have now, towards the end of their careers, joined forces to fight a common enemy. Most likely, the tanks shown in the photo are both part of the Shiite army supported by Iran and the photo demonstrates how much the chaos sweeping through the region has mixed everything up. The T-72C is the exported modernized version of the T-72 tank. It is 30 years old and is part of the Iranian Armed Forces, the only foreign military that bought this modification. The deal was made back in November 1991 and foresaw the licensed production in Iran of 1,000 T-72Cs. Before the licensing agreement the tanks were exported to Iran directly from the factory. One hundred tanks were sent there in 1993. In Iraq, even after the American occupation, the government continued to show interest in Russian armored vehicles, to which the local tank crews had been accustomed. The Iraqi army still receives these vehicles from Eastern European countries. But in February 2013 former Iraqi Defense Minister Lieutenant-General Abdul Qadir Mohammed Jassim Obeidi al-Mifarji' announced that the army would no longer buy any "Eastern tanks," since they are "just bombs on caterpillar tracks." He meant that the ammunition would detonate at the slightest penetration of the armor, as often happened in skirmishes involving these Soviet tanks in the Gulf wars. Meanwhile, from 2010 to 2013 the Iranian Armed Forces received 146 M1A1M Abrams tanks from the U.S. Army and in December 2014 the Pentagon announced that Iraq would receive 175 modernized M1A1M Abrams tanks. But the start of military activity against ISIS upset these plans and Iraq, it seems, is once again interested in "Eastern tanks." It also turns out that, in the fight against ISIS, Soviet tanks are just as capable of doing the job, especially where selecting tank crews and finding spare parts is concerned. The Czech press has received information that a local company called Excalibur Army (which is part of the Excalibur Group) will soon start supplying Iraq with renovated T-72 tanks and BMP-1 infantry fighting machines from the Czech army. The situation with Iraq's weapons is complex. The multi-million-dollar weapons supply contacts between the U.S. and the Iraqi government are not being realized. According to Hakim al-Zamili, the head of the Iraqi Parliamentary Security and Defense Committee, the country is not only not receiving the promised F-16 destroyers, Apache helicopters and armed vehicles, but also light and medium weaponry. The 2008 contracts had stated that the U.S. was not only obliged to supply the technology, but also prepare the military personnel. This has led to Russia and Iran coming to Iraq's aid. Unlike the U.S., Russia and Iran are not far away across the ocean and do not risk having serious problems at home in the event that the Islamic State emerges victorious. In the summer of 2014, in a relatively short period of time, Russia supplied Iraq with more than 10 SU-24 ground attack aircraft, the new MI-28 attack helicopters and the Solntsepek TOC-1A propelled flamethrowers. The latter is modeled after the T-90C combat tank and, according to many mass media sources, the Iraqi army is so pleased with the quality of its chassis that it is considering buying the T-90C and the BMOP-72 Terminator-2 modeled after it (or after the T-72), which would be very useful in retaking cities from ISIS. Meanwhile, the local military has the unique possibility of comparing the T-72C and the M1A1M Abrams right on the battlefield.